COP Setup allows you to customize the package to some degree. You will run this application once while you are converting from your former Order Processing system. You will rarely need to refer to it thereafter. You will be allowed to specify such things as the starting order number, profit center usage, and the taxable status of freight and miscellaneous charges. You will also determine whether you wish to print your company name on invoices, and if statements and invoices will print on laser forms. The responses you provide here will affect processing in a large number of programs, so consider them carefully. Additionally, review the features and options available in Global Setup. 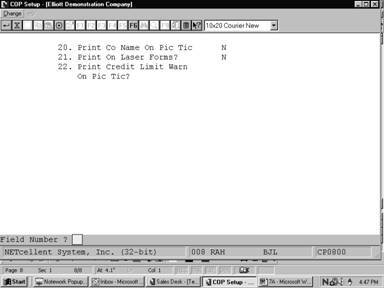 * If this is the first time that you have run COP Setup, then the program will ask you to enter the data for each of the fields on the screen. If this program has been run previously, the data entered at that time will be displayed and may be changed. Enter the first order number which will be assigned during entry of orders. This field will be automatically incremented every time an order is entered. If O is entered, the profit center, and department (if applicable), which is the second and third part of account number, will be entered for the order as a whole. This is done if you wish to track revenue by sales locations rather than by product category. If P is entered, the profit center may be different for each line item on the order as it will be associated with the product category of each item. Enter an N if miscellaneous charges are not taxable in your state. Enter an F if they are taxable. If P is entered, a portion of the miscellaneous charges will be taxed, depending on the ratio of taxable sale amount to non‑taxable sale amount, e.g., if the invoice shows a sale amount of $100.00, $20.00 of which is non‑taxable, then 80% of the miscellaneous charges would be taxed. Enter an N if freight charges are not taxable in your state. Enter an F if they are taxable. If P is entered, a portion of the freight charges will be taxed, depending on the ratio of taxable sale amount to non‑taxable sale amount. For example, if the invoice shows a sale amount of $100.00, $20.00 of which is non‑taxable, then 80% of the freight charges would be taxed. 8 one‑digit numeric entries. 9 not allowed (9). The entries made here determine which price code types are used and the order which the package will check them when figuring an item's price. See Pricing Code File Maintenance for more data on price codes. If you are using more than one price code type, you will need to make a decision about the order in which the codes are checked when prices are being ascertained in Order Entry. If you are using negotiated prices (Type 1) you will want this to appear first to avoid the possibility of the customer being charged a different price from that which was agreed upon. Price code types not specified here will not be recognized any­where in the package. 6. Print Co Name on Invoice ? This flag simply determines whether the company name is printed on the invoice by the computer. If Y is entered, the company name will be printed. You would answer N if your company name is preprinted on the invoice form. Enter the commission method that will be used when calculating commission for each order/invoice. If you select S, the commission amount will be calculated based upon the total sale amount for the order. If you select M, the commission amount will be calculated based upon the total gross margin (Total Sale Amount ‑ Total Cost Amount) for the order. If you select I, the commission amount will be calculated based upon each item on the order. The commission method for each item is determined by the item commission method in Item File Maintenance. For more information on item commission method, refer to Item File Maintenance in Inventory Manage­ment. 8. Post Cost Of Goods Sold ? Enter whether you wish to have an I/M distribution for Cost of Goods Sold created when posting in­voices. Enter the default Cost of Goods Sold account that will be used if a valid product category/location record does not exist for the item. Pressing the F7 key will allow you to search for the account by number or pressing the F8 key will allow you to search for the account by description. Enter the item cost to be used when using markup percent in Pricing Code File Maintenance. If the costing method in I/M Setup is LIFO or FIFO, the LIFO/FIFO cost will not be used for markup. Instead, the item cost selected here will be used. Enter the cost you wish to use when posting invoices. If you select L, the posting program will use the cost that was entered on the line item during Order Entry. If you selection A, the posting program will use the actual cost of the item at the time of posting. The actual cost used will depend on the costing method in I/M Setup. This field will not apply when the costing method is LIFO or FIFO The item cost when using either of these methods is calculated from the layers in the LIFO/FIFO file during posting. 12. Display Item Cost at Line Item Entry Time ? If you answer N, Item Cost will not be displayed on the Order Entry screen during Order Entry. 13. Print Cost on Edit Lists ? 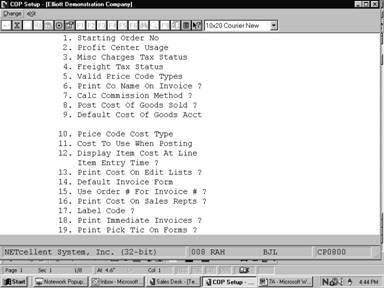 If you answer N, Item Cost will not be printed on the Order Edit and the Billing Edit Lists. Enter the default form number you want to use when printing invoices. Default is 1. If you answered Y to this question, all orders will be posted to Accounts Receivable using order numbers. No backorders will be allowed for orders. You must select all line items and post to Accounts Receivable if the flag is set to Y. The default is N.
16. Print Cost On Sales Repts ? This flag simply determines if the cost will be printed on Sales Reports. The default is N.
This simply determines what label code will be used when printing labels. The label code is defined in Label Code Setup application. 18. Print Immediate Invoices ? If you answer Y during Order Entry of I type, (Invoice) or C type (Credit Memo) you will be asked if you want to print invoices immediately. If N, order entry will ask for another transaction. If the answer is Y to the question, you will immediately go into invoice printing. 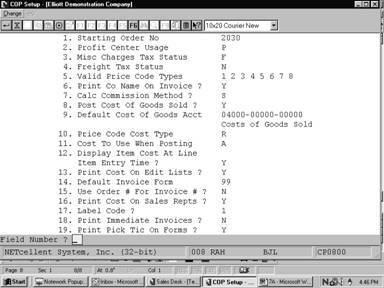 See Print Invoices in the Processing section. 19. Print Pic Tic On Forms ? This flag determines if the picking tickets will be printed on pre-printed forms. Default is N.
This field is only applicable if you are printing the picking tickets on pre-printed forms. If you answer Y to the question, the company name and address from Company Setup will print in the upper left hand corner of the picking ticket. If you answer N, the company name and address will not be printed. 21. Print On Laser Forms? Enter I to print invoices on laser forms. Enter P to print picking tickets on laser forms.